this is great! I've seen a couple that I haven't been able to get b/c I saw them in traffic. And whatever you've heard about Atlanta traffic, it's worse. So I didn't stop. 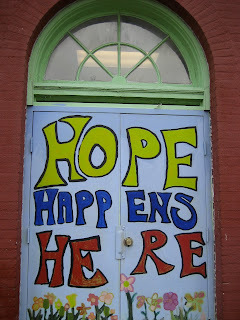 Go here and see the original door project. She's got some neat stuff. May the door of your heart and the door of your spirit always look like the one in your picture. Adventure lies on the other side! Oh how I love that door! I think your door will be revealed at the exact precise moment Merry...and wow what a door that will be. Hmmm....Door Number One, Two, or Three? I bet it is every bit as beautiful as you are and will be led by the Master's hands Himself!